Choose the “Walking” option after selecting the Navigation icon (left) to use Walking Navigation (right). Is there a full changelog available? Curious if this solves the problem with Navigation exiting whenever the screen goes to Standby that a lot of people seem to be having. Bring navigation to Sweden. pretty please. Is there a way to clear history? Oh! This is so cool! Thank you, Thank you, Thank you! While the new features are great I really don't like the new search bar in Maps. It just takes up too much screen real estate and doesn't provide any improvements to the experience because it doesn't make a difference if I tap on the hardware search button or into the search bar. Why can't we even disable it? It really is disappointing. The hardware buttons are one of the biggest advantages of the whole Android platform, now you made them obsolete with this update. how do you hide this new map search bar and shortcuts - this is taking up precious screen real estate and needs to be gone! The new search bar is nifty, but its a SPACE HOG in landscape(like-when its in my CAR dock-duh)! They also removed the layers and current location lab buttons, presumably because they moved it to the space hogging search bar. They need to make those available again as well and allow the bar to be hidden. In other words, I need this search bar gone but still have easy access to layers and current location. I'm restoring to my backup of maps4.4.0.apk until this is addressed. Agree with others! Search bar takes up space and why have it as a 'dedciated' tool when, as stated before, I can just tap the search button on my phone when in maps. It was dedicated to searching maps before Google ever decided to make such a tool. And the location and layers buttons where fine how they were. Why do this if you're only going to take away from the screen real estate. Usually, I'm pretty happy with the little tweaks that Google makes to all its programs as they are usually more refined and less obtrusive. This update redesign is a huge FAIL! Did anyone else notice that when you hit menu, there's another 'Search' button option that pops up on the screen. So now I have the dedicated screen hog tool, the dedicated hardware button, and the dedicated menu sub option all to find something on my map. Wow, talk about poor execution. I guess Google just wants to make sure we don't get lost. You know what feature would be even more awesome? Google Navigation for Australia. I'm getting "The package file was not signed correctly" while trying to install the Street View On Google Maps app. Google never ceases to amaze me with their free products. Please keep innovating! What a wonderful company. I'm gushing I know. Please add bike navigation! I can't wait until this is enabled. The search toolbar is totally redundant on the Motorola A855 Droid. How do I get back to version 4.4.0? Now that is just way too cool dude. What's the music in the "Smart Navigation" video? It sounds really familiar. Google Maps is a great product and I use it all the time, but I agree with the others - I just can't understand why the search bar had to be added, taking up a swath of my screen. Initially I assumed there's be a way to hide it, but alas not. +1 for possibility to disable the space-hogging search bar. It's not even faster to use than pressing the hardware search button. Also, it seems that the street addresses here in Helsinki, Finland still show up randomly in Finnish or Swedish. This is a bilingual city, but it's confusing to see the two languages mixed. I'm getting "The package file was not signed correctly" while trying to install the Street View In Google Maps app. 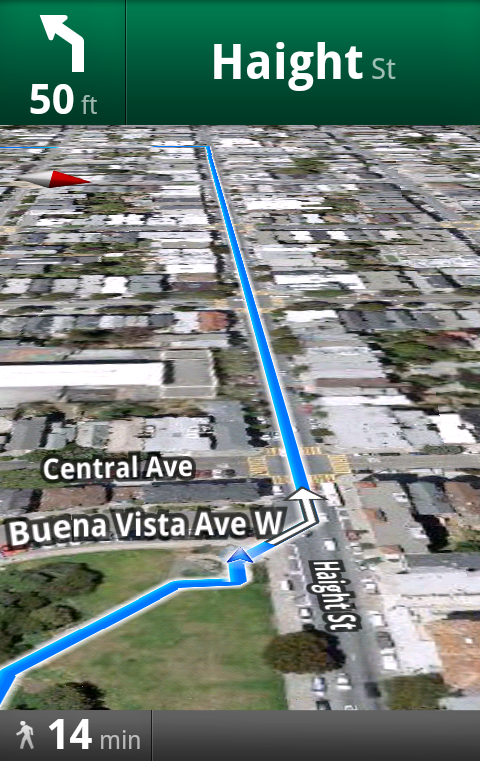 Nothing makes me happier than new Google Maps for Android updates until today. There are new devices that have smaller screens such as the Motorola Charm and Flipout. The always on search bar needs to be made an option as soon as possible. I miss the smaller and more efficient Labs options. It is now almost impossible to pinch to zoom with so much real estate taken up. One thing we really need is a way to choose between metric and imperial units. I'm in Sweden, and even though I've selected "English (Sweden)" as my locale, Maps still shows distances in miles. Changing my language to Swedish helps, but since most apps are English-only I prefer using English everywhere in my phone. The new menu bar always being visible doesn't take up too much room on my HTC EVO, but it would be nice to have the option to hide it. I also would love to see bicycling navigation, I'm surprised it didn't come before walking navigation. Thanks for these awesome free tools! Por que eso no funciona en Mexico! ni Google Navigate y ahora tampoco Google Maps... algun dia se podran usar estas aplicaciones al 100%? Switching from the iphone to nexus one, one of the things I liked so much about google maps was the lack of a search bar taking up map space. Sad to see that's not the case anymore. Please give us an option to DISABLE the search bar, it takes up WAY too much space !!! This is ridiculous, not even an option to disable this unwanted thing. We want a MAP not a search bar taking up space. looks like others are getting this same error - is it going to be fixed soon? i'm a user of googlemaps by nokia. It's great for travelling and sport.. Nice info.. Please make the top bar appear only when search is presses. It takes too much space. The Functionality of the new version is great!! I agree with Stan, The search screen / menu items should pop-up only when you want to search for something then go away. The find places, layers and where am I functions should appear when you press one of the bottom buttons, I don't care which one (I have Droid X). FANTASTIC software!!! The rating and distance search criteria is perfect. I was waiting for this option. I just hope the screen doesn't sleep when I'm using it in my car. Please please make the search bar an option. It takes up too much screen space when I just want to see the map. I totally want to know what that music is or who produced it. Shazam or any other music identification software came up with nothing. What i can do if i lost my gmail google mobile account? The problem I have is this version as well as the previous version, Google Maps is ignoring the text-to-speech settings and uses the default robotic voice for navigation. I liked using the UK English one. Adds a bit of humor to the drive. Plus its funny to show other people that I can get my navigation in German as well. Yes and I hate the search bar. If I want to search, have it appear when I hit the search button. Also the My Location button really needs to be in the lower right corner, you know, where my thumb can reach it when I have the phone in my right hand. Like normal people do. We can't always be using two hands to use the phone, hence why I have an Incredible and not an Evo or a Droid X. The form factor is too large. Now Google moves my buttons out of my reach. Come on guys, we aren't sitting in offices using these phones and devices, we are out living our lives. Please change this. I am going to revert to the old version for now. Please get some REAL people to do your testing before you release to the general public. When will it be available for Blackbeery? Please release an update that will show the next cross street when using the navigation app with no destination is input. Any news yet about Google Navigation for the iPhone? I will not give up my iPhone for an Android phone, but I love using Google. They're coming out with some cool apps for the iPhone soon but I'm hoping their navigation is one of them! Hurry!!! We need to have the option to disable the search bar. I want a map, not a search bar. I already have a hardware search button always available. The music on the video is "Drinking About You" by Route 215, according to Shazam. Again blog about apps and upgrades not available if you are based in Turkey with no indication if and when it will be available... what is the case for the rest? I have been a long time user of Google Maps and truly have appreciated the application on my home computer, on my iPhone, then on my original Droid, and especially now on my Droid X. However, after this most recent update, running the application on my cool new Android device just makes me shake my head. As soon as I opened the application for the first time after the update while getting ready to drive to work, my first reaction was, "Wow, that's cool. They took some of the little apps from Labs and implemented them permenantly into the main application. Wait... My map/screen looks smaller... Oh no. Are you serious? How can I disable this... OH NO! I CAN'T??!!!" I then waisted 15 minutes drilling though menus in disbelief. I thought to myself, "Someone actually thought this was a good idea!?" I couldn't believe it. Much head shaking has followed since. Even with a 4.3" screen, that's a lot of real estate to take away! Man, think if I still had my original Droid... I'd be even more disappointed. As many have said, if I want to search, I'll hit the SEARCH button, or select Search by hitting the menu button. And as far as the Layers and My Location buttons - yes, they're great! As soon as I saw them in Labs I turned them on and have never turned them off. But, I liked them WHERE THEY WERE! Please put them back on the side since you have much more real estate to spare in landscape mode, left to right, than you do top to bottom. That got me thinking that if you went a step further and allowed users to hide the Notification Bar when using an application, like Google Maps, you would gain even MORE real estate! This, of course, would be most important in landscape mode, but isn't that how the phone is supposed to sit while mounted in the Car Dock? How cool would that be! Having the option to use the entire 4.3" screen to navigate and display maps while driving would be fantastic! In addition, please allow us to use a "Navigation View" like in the Navigation app, while using Maps instead of just the bird's eye view. Dedicated GPS units do this. The first-person-like view helps me navigate when I'm driving. When I see my destination on my right, I turn right, as opposed to seeing my location move in every cardinal direction. Can you please make it an option to view the maps in either a bird's eye view, or a "Navigation View"? Now, I understand allowing us to hide the Notification Bar may be blasphemy, and the ability to view maps in a "navigation/first person type view" may be preposterous and out of the question. But seriously, remove that friggin' search bar! It's redundant and really irritating. You're creating a legion on upset drivers... What were you guys thinking? It would be great if you could tap into some kind of crime location database and avoid common historical pick pocket / mugging areas as well. Especially good for traveling. Just a thought for future possible features.